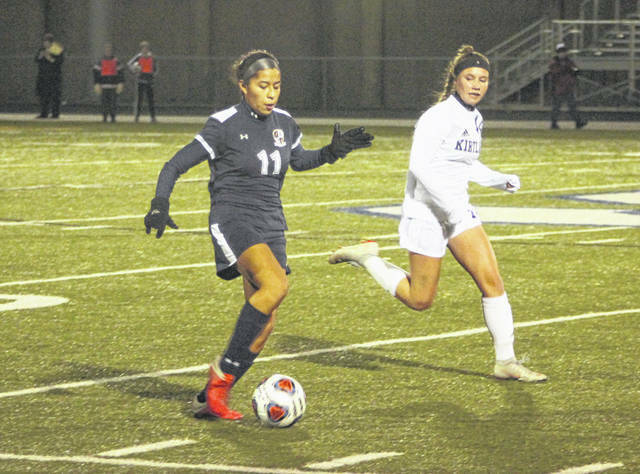 Brittney Ramirez of Archbold works the ball up the field Tuesday versus Kirtland in a Division III state semifinal at Sandusky’s Cedar Point Stadium. 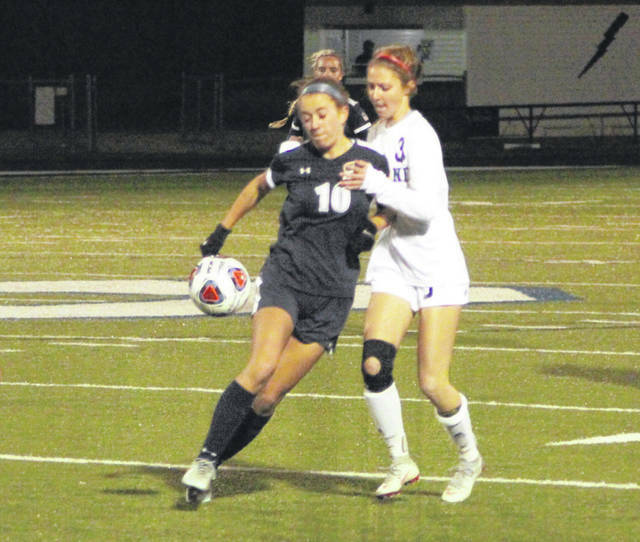 The Blue Streaks saw their season come to an end with a 1-0 loss. Archbold’s Faith Wyse (9) controls a ball Tuesday during the state semifinal. Chloe Nofziger of Archbold, left, boxes out Lilia Valentic of Kirtland for a ball. 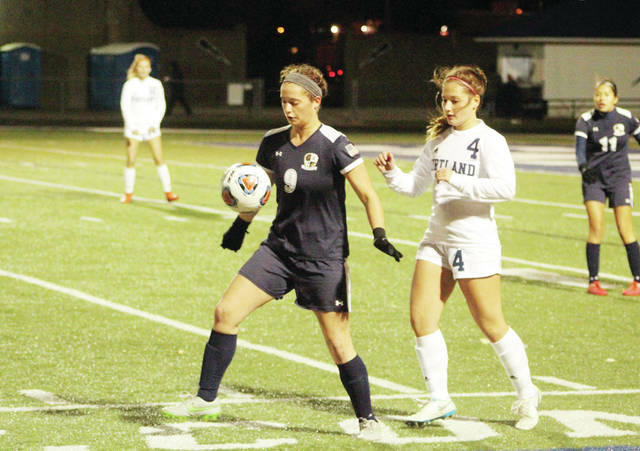 SANDUSKY – An athletic Kirtland team was too much for Archbold to overcome, falling 1-0 in a Division III girls soccer state semifinal on a blustery night at Cedar Point Stadium in Sandusky Tuesday. It was the first of a pair of Archbold and Kirtland state semifinal matchups, as the Blue Streak boys were victorious in the nightcap to punch a ticket to the state title game. Although neither team could muster many shots on goal in the first half, the ball seemed to be near Archbold’s net more often than not. Zschuppe had a pair of quality looks in the first half, however, she couldn’t find the back of the net. First, she got behind the defense and drilled one that sailed high, ricocheting off the football crossbar above the goal with 19:08 left in the first half. Then at the 11:15 mark, her boot from 10 yards out pushed to the right of the net. The Hornets struck gold when Lidia Rodin was given a free kick near the sideline with just under eight minutes left in the half. She was able to bend the ball in over the head of Archbold keeper Reagan Kohler for a 1-0 lead. On a windy night like it was, one might have thought the wind played a hand in knocking the shot down. But, there wasn’t much the Streaks could do according to assistant coach Kidder. Archbold refused to go away quietly. Just over six minutes into the second half, Addison Moyer had a straight on shot from 10 yards away that was right to the Hornet keeper. Later in the half, Archbold’s Kalyn Baker took a centering pass and fired a shot that missed to the left with 18:26 remaining. Kirtland did a nice job keeping the ball on the Blue Streaks’ side in the closing minutes. The Streaks end the season at 15-2-4, a great send off for their six seniors. They even were down perhaps their best senior athlete, Andi Peterson, for much of the game. She had a lingering injury flare up and missed the entire second half.